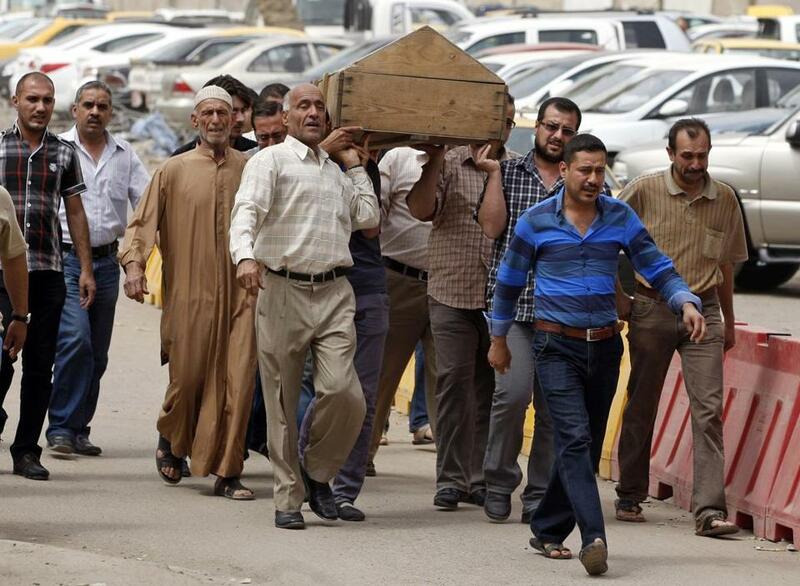 Mourners carried the coffin of a man killed in a liquor store attack in Baghdad, Iraq. More than a year after US forces left Iraq, the renewed sectarian violence raises fears that Iraq and other nations in the region could slide into chaos. BAGHDAD — Renewed sectarian killing has brought the highest death toll in Iraq in five years. Young Iraqi scholars at a Shi’ite Muslim seminary volunteer to fight Sunnis in Syria. Far to the west, in Lebanon, clashes have worsened between opposing sects in the northern city of Tripoli. In Syria itself, “Shi’ites have become a main target,” said Jad, an opposition activist visiting Lebanon from a rebel-held Syrian town, Qusair, whose brother died Tuesday battling Shi’ite guerrillas from the Lebanese militia Hezbollah. “People lost brothers, sons, and they’re angry,” Jad said, using a nickname for safety. The Syrian civil war is setting off a contagious sectarian conflict beyond the country’s borders, reigniting long-simmering tensions between Sunnis and Shi’ites, and, experts fear, shaking the foundations of countries cobbled together after the collapse of the Ottoman Empire. For months, the fighting in Syria has spilled across its borders as rockets landed in neighboring countries or skirmishes crossed into their territories. But now, the Syrian war, with more than 80,000 dead, is inciting Sunnis and Shi’ites in other countries to attack one another. The Syrian uprising began as peaceful protests against Assad and transformed during two years into a bloody battle of attrition. But the killing is no longer just about supporting or opposing the government, or even about Syria. Some Shi’ites are pouring into Syria out of a sense of religious duty. In Iraq, random attacks on Sunni mosques and neighborhoods that had subsided in recent years have resumed — a wedding was recently hit — as Sunni militias fight the army. With Sunni-led Saudi Arabia, Qatar, and Turkey backing the uprising against Assad, who is supported by Shi’ite Iran and Hezbollah, sectarian splits simmering since the American invasion of Iraq are spreading across a region already upended by the Arab uprisings. These broader antagonisms that fuel, and are fueled by, the Syrian war are primarily rooted in clashing geopolitical and strategic interests: the power struggle between Saudi Arabia and Iran; Iran’s confrontation with the West about its nuclear program; and the alliance between Hezbollah and the secular Syrian government of Assad against US-backed Israel. But sectarian feeling has seeped in. Iraq has been especially vulnerable. With the Sunni majority in Syria battling to overthrow a government dominated by Assad’s Alawite sect, an offshoot of Shi’ism, some in Iraq’s Sunni minority grew emboldened by the prospect of overthrowing their own Shi’ite government. The United Nations mission to Iraq said Saturday that more than 1,000 people were killed in violence across the country last month — the highest monthly death toll in years. Today, many Iraqis feel they are on the road back to the dark days of 2006 and ’07, the peak of sectarian militia massacres by Shi’ites ascendant after years of oppression under Saddam Hussein, and by minority Sunnis disempowered by his fall. While the 2007 US troop surge helped to limit bloodshed, random attacks against Shi’ites never ended. What was different was that the Shi’ites, who finally felt in control of the security forces, stopped retaliating. But that seems to be changing. Sunni militias have risen up to fight the army, and for the first time in years Sunni mosques and neighborhoods are being regularly targeted. The first notable attack was in April, at a cafe in the Sunni neighborhood of Amariya; it started late at night as young men played pool, and it left dozens of people dead. While it is unclear who is responsible for the new violence, many Sunnis blame the government, or Iranian-backed Shi’ite militias. In Lebanon, clashes between Alawite and Sunni militias in Tripoli have reached their worst level in years as each side blames the other for carnage in Syria. In Syria, the government and its opponents insist that their civil war is not a fight between religious sects. Rebel leaders say their only aim is to depose a dictator. Assad says he is fending off extremist terrorists, and he is careful not to frame the conflict as a fight against the country’s Sunni majority. Assad’s affinity with Hezbollah and Iran is primarily strategic. Though his sect provides bedrock support, most Alawites are secular, and the country’s fewer than 200,000 Shi’ites are a much smaller portion of the population. Like Iraqis — who long insisted they were Iraqis first, and blamed outsiders for the rise of sectarian identity, yet descended into bloodletting — Syrians on both sides fear and disavow the slide into sectarianism. But in real terms, Shi’ite Hezbollah and the Sunni-dominated Al Nusra Front, a radical Sunni group allied with Al Qaeda, have emerged as two of the strongest militias facing off in the Syrian civil war. Both sides have also been willing to tap into sectarian alliances and emotions. With the West hesitant to fully support the opposition, rebels accepted help from Al Qaeda in Iraq, a Sunni militant group, and the reliable pipeline of weapons and cash flowing from extremist Sunni donors to jihadists, whose calls for an Islamic state found support among some Syrians influenced by hard-line clerics in Saudi Arabia.